If you're holding an event where you are serving soda or beer in cans or bottles, the perfect party favor is a personalized coozie. A perfect gift for your wedding celebration. Now available in a choice of colors, these leatherette covered can cooler coozies are perfect for the beer drinker or soda drinker in your wedding party. Whatever the reason for the celebration these coozies will keep your guests favorite beverage cool and their hands dry. These can coolers are personalized on the attached chrome finish plate for a memorable, personalized gift. Coordinating flasks are also available. All our flasks and can cooler coozies can be personalized and shipped within 48 hours. A great way to keep your cool. 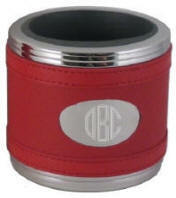 This red leatherette covered metal can cooler is personalized on the attached plate. Keeps your hands dry and your beer or soda cool. 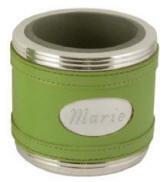 Lime green leatherette covers this metal can cooler coozie, perfectly engraved on the attached metal plate in your choice of lettering, or a monogram style. 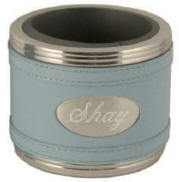 We engrave this light blue leatherette covered can cooler with a name, initials, or a monogram style. A personalized can cooler can be the perfect gift for your wedding party. Orders ship in 24-48 hrs.